Besides the degradation of organic compounds in the troposphere by radical reactions (OH and NO3 radicals), further non-radical interactions with oxidants like ozone and hydrogen peroxide (H2O2) take place. These reactions occur significantly slower than the radical reactions but may provide great turnovers since the concentrations of ozone and H2O2 exceed those of the radicals in a cloud droplet by several orders of magnitude. Furthermore, accretion reactions of organic compounds such as carbonyl compounds are investigated resulting in products of higher molecular weight. The UV/VIS spectroscopy, the stopped flow method (Figure 1) as well as other analytical techniques, such as LC-MS/MS(Q-IMS-ToF), standard HPLC-QMS, GC-MS and CE-UV or CE-MS, are used to investigate the non-radical reactions. 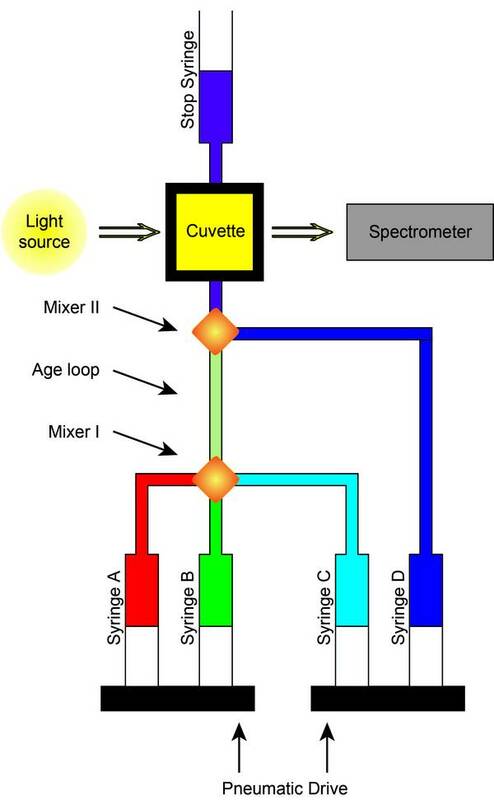 Figure 1: Scheme of the stopped-flow-spectrometer. Schöne L., Herrmann H. (2014) Kinetic measurements of the reactivity of hydrogen peroxide and ozone towards small atmospherically relevant aldehydes, ketones and organic acids in aqueous solutions. Atmos Chem Phys 14 (9), 4503-4514, doi: 10.5194/acp-14-4503-2014.